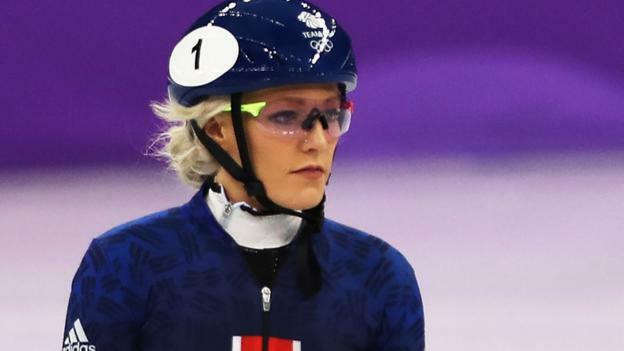 Elise Christie felt “very alone” after the Winter Olympics. Her campaign in Pyeongchang did not go to plan when she came home empty-handed. Then her boyfriend dumped her and her coach left his role. For five months after February’s Games, she thought it was, perhaps, the point to call time on her short-track speed skating career. “I went through a period where I thought ‘I hate it’, I didn’t see the point in what I was doing,” she told BBC Radio 5 live’s Friday Sports Panel. Triple world champion Christie was the poster girl for Team GB and had been tipped for multiple medals in Pyeongchang. Instead, an ankle injury was her only token from a Games she will almost certainly want to forget. But, nine months on, the 28-year-old is back on the ice – happier and stronger than ever. The Olympics hasn’t been Christie’s friend to date. Her campaign in Sochi in 2014 ended in three disqualifications and, in Pyeongchang, she fell in the 500m final and 1500m semi-finals – damaging ankle ligaments in the latter – and was disqualified from the 1,000m heats. She had expected to return from South Korea an Olympic medallist – instead, she was left questioning what her future held. “My ankle was so bad and I was still in pain from the other injuries I’d suffered last year, and I’d get on the ice every day and think ‘I just don’t know what I’m doing’,” Christie said. “I didn’t believe I could turn it around, my ankle was never going to get better – did I really want to go through another four years of this? It hasn’t been the easiest of years for Christie. After the disappointment of the Olympics, two big departures from her close circle left her feeling isolated. First, her boyfriend – Hungarian speed skater Shaolin Sandor Liu, who won his country’s first-ever Winter Olympic gold medal in Pyeongchang – ended their relationship. By text message. Then, Nicky Gooch, Christie’s coach and Lillehammer 1994 Olympic bronze medallist, left his role. “The person I’ve always been closest to, who I’ve worked with for 12 years, was Nick my coach and he left,” she said. “I did feel very alone which didn’t help, and that’s why it probably took longer, but I have built new relationships now, I’ve worked with the sports psychologist, and without all that, I wouldn’t have been able to get to where I have got right now. “The final straw for me was the boyfriend, I lost my whole support network. But, while motivation mostly must come from within, Christie did receive some help along the way. During and following the Olympics, she received hundreds of messages of support – many of which were from children. And that, she says, gave her the boost she needed to continue. “Children have this untainted view on life where they haven’t been told to think a certain way and they have not been affected by the world yet,” she said. “They were all saying ‘don’t give up’, ‘you’re my hero’ and things like this, and for me, I didn’t have a good enough reason to show them to give up. Earlier this month, Christie returned to competition as part of the British mixed relay team at the opening World Cup event of the season. Yet, while she didn’t compete in the individual events in Calgary, Canada, she came home with a much clearer focus. “I went to a competition and had all these younger skaters come up to me asking why I wasn’t racing, telling me I was one of the best skaters in the world,” she said.